Myanmar citizens wait outside the Myanmar Embassy in Singapore to cast advance ballots on Oct. 18, 2015. Myanmar Embassy officials in Singapore have extended early voting there through at least Wednesday amid criticism of alleged voting manipulation at Myanmar embassies in various countries. Officials on Sunday had told potential voters in Singapore - some camping overnight on sidewalks - that only the first 3,000 in line would be able to cast ballots. Some 20,000 Myanmar nationals in Singapore had requested to vote in advance of their country's November 8 general election. Myanmar embassies in various countries, including Singapore and Thailand, have faced a backlash of angry voters complaining about delays and being denied the right to cast ballots. Thailand is home to an estimated several million Myanmar citizens but less than 700 were deemed eligible to cast ballots – and a number of those faced difficulties when they actually went to the embassy in Bangkok to vote. Nwe Nwe Win, an engineer training in Bangkok, said she was also on the early voting list but was not allowed to cast ballots. “I'm very unsatisfied with the results today,” she told VOA. Similar complaints were listed on social media by early voters who went to embassies in Canberra, Seoul, Tokyo and Washington. Myanmar people living in Thailand line up for early voting outside Myanmar Embassy in Bangkok, Thailand, Saturday, Oct. 17, 2015. 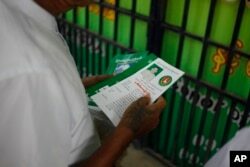 A member of military-backed Union Solidarity and Development Party holds leaflets promoting a candidate of USDP during an election campaign in Mandalay, the second largest city in Myanmar, Oct. 18, 2015. Manipulation would be seen as favoring the Union Solidarity and Development Party, headed by President Thein Sein and supported by the powerful military. Observers note that the USDP needs only to capture about 10 to 15 percent of the available seats in parliament to form a coalition as 25 percent of the legislature is appointed by the military. The National League for Democracy, the party of opposition leader Aung San Suu Kyi, is expected to make significant gains in the polling. The Nobel Peace Prize laureate, however, is barred by the junta-drafted constitution from becoming president. Myanmar's national election commission last week briefly considered delaying the election, contending with logistical issues because of recent serious flooding. The NLD was the only party to raise objection, according to its officials, and the election commission announced balloting would proceed as scheduled. The NLD secured 80 percent of the legislative seats in the 1990 election, but results were nullified by the military, which refused to hand over power and then put Suu Kyi under house arrest for years.